Put your best finish forward with Eraser! CarPro Eraser is an IPA and more! Eraser is an intense cleaner designed to dissolve oil particles and remove polish residue to prepare the paintwork for Cquartz. Eraser attracts polish residue and dust better and cleans better than an ordinary IPA. Eraser makes it possible for everyone to get the perfect Cquartz finish. An IPA, or isopropyl alcohol and water mixture, is used to remove polish residue and fillers from auto paint before a wax or paint sealant is applied. This step allows you to check your work following compounding and it is supposed to ensure a totally clean paint surface on which the LSP (last step product) can bond. However, IPAs lift oil and dust, but they can be redeposited as you wipe the paint. 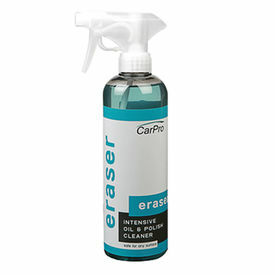 Eraser goes a step farther with an intense cleaner that dissolves oil. It also attracts the dust left by compounding. When you wipe down your vehicle with Eraser Intense Oil & Polish Cleanser, you're removing oils, fillers, and dust completely. Once you apply CQuartz, it will bond better and create an even, long-lasting shine with great protection. Eraser also has anti-static components to resist dusting after wiping. The paint will stay dust-free while you're in the process of applying Cquartz so you don't have to keep re-cleaning. Eraser contains no silicone and is completely safe for use in paint shops and body shops. Plus, Eraser smells great, which is definitely not true of a homemade IPA! CarPro Eraser Intense Oil & Polish Cleanser is the next level of IPA. Prepare your vehicle for the best results with Cquartz by erasing oil and polish residue. Spray on surface and wipe off with soft microfiber .